The Model 828 tobacco moisture sensor is considered by many as being the flag ship of MoistTech’s IR Series of sensors. It has resulted in unmatched performance for tobacco moisture measurement and control within all levels of the tobacco industry. Our long standing relationship with most tobacco processors confirms that our knowledge and experience is second to none. MoistTech’s professional staff continues to develop products for the tobacco industry showing our commitment to the industry. Dryer control is the most sensitive area of the tobacco process. Thousands of kilos per hour are processed where volume, temperature and input moisture vary. The MoistTech model 828 tobacco moisture sensor provides the user with the ability to monitor and control this process to within tenths of a percent. Installation of the Model 828 provides manufactures exceptionally accurate and precise tobacco moisture measurement and control protocols. It is able to accurately measure to within 0.1% on many applications – resulting in improved product quality and significant cost savings. To improve threshing efficiency and reduce the quantity of lamina, moisture control is extremely important. High accurate and fast response to moisture sensing allows for the manufacturer to conduct 100% inspection while optimizing the process by producing a quality product at reduced cost. Our on-line tobacco moisture measurement and control sensors also have the ability to measure temperatures and other tobacco components, such as sugar and nicotine if required. 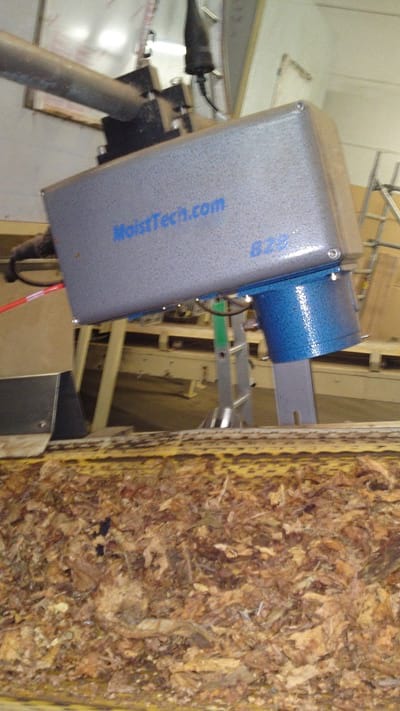 MoistTech’s NIR analyzer, the Model 828 tobacco moisture sensor, is used for on-line tobacco moisture analysis at all locations in tobacco leaf and primary processing. The bullets below list the applications for each tobacco moisture measurement. The accuracy that can be achieved depends on the sampling and testing methods. Whole leaf and strip tobacco will have higher sampling errors than cut finished tobacco due to the variability of the material. MoistTech’s development of the most advanced on-line series of NIR sensors has resulted in the company being the leader in process control of moisture throughout the tobacco industry. 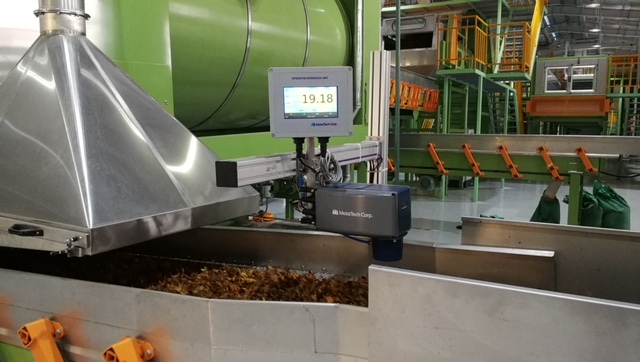 Experience in the tobacco process has allowed us to develop the most accurate on-line, non contact moisture analyzer for use in primary processing, leaf processing and cut tobacco applications. The IR-3000 online moisture transmitter and the Model 828 tobacco moisture sensor are renowned for their rugged design and ability to withstand the harsh environments of the tobacco factory. These sensors are unaffected by product height, flow, ambient light, and temperature. The accuracy is with 0.1% on most applications.